A nation in need of hope, the most powerful rocket ever launched, and the first three men to break the bounds of Earth: Apollo 8 was headed to the moon. In 1957, when the USSR launched Sputnik I, the first man-made satellite to orbit Earth, America’s rival in the Cold War claimed victory on a new frontier. The Space Race had begun, and the United States was losing. Closer to home, a decade of turbulence would soon have Americans reeling, with the year 1968 alone seeing the assassinations of Martin Luther King Jr. and Robert F. Kennedy as well as many violent clashes between police and protesters. Americans desperately needed something good to believe in, and NASA’s mission to orbit Earth in Apollo 8 and test a lunar landing module was being planned for the end of the year. But with four months to go and the module behind schedule, the CIA discovered that the USSR was preparing to send its own mission around the moon — another crucial victory in the Space Race — and it was clearly time for a change of plan. In a volume full of astonishing full-color photographs, including the iconic Earthrise photo, Martin W. Sandler unfolds an incredible chapter in U.S. history: Apollo 8 wouldn’t just orbit Earth, it would take American astronauts to see the dark side of the moon. Martin W. Sandler has written more than seventy books for children and adults, including The Impossible Rescue: The True Story of an Amazing Arctic Adventure and The Whydah: A Pirate Ship Feared, Wrecked, and Found. He lives in Massachusetts. The book is abundantly illustrated with archival photographs, and a highlight of this informative, engaging text is Sandler's discussion of the iconic Earthrise photograph and how it "became a symbol of the Earth's fragility, a reminder of just how small and insignificant the Earth's place in the universe truly is." In its 50th-anniversary year, a compelling account of the historical significance of a lesser-known space mission. 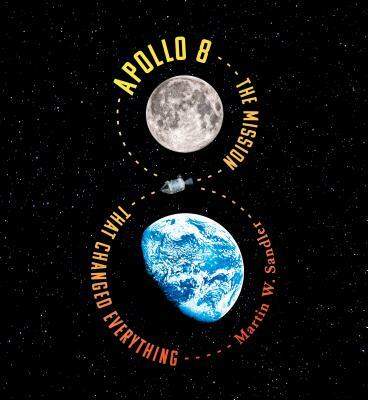 Sandler captures Apollo 8’s significance on many levels with astonishing details and storytelling...Stunning photographs, including the now iconic Earthrise, bring this awe to a new generation. Sandler traces mankind’s curiosity about the moon from ancient mythology to the 1960s. Full-color photographs enhance nearly every page and offer readers a greater understanding of this revolutionary mission. An out-of-this-world exploration of the space race—and a must-have for most nonfiction collections. Sandler deals equally well with technical and personal narrative threads, explaining the challenges of navigation and reentry and attending to the very different personalities crammed into the tiny command capsule...He also pays serious attention to the cultural impact of the mission, whose photographs of Earthrise inspired a fresh way of looking at the home planet and of appreciating its fragility, thus advancing not only the space program but also the ecology movement. Just as the crew’s photographs and telecasts brought their discoveries into American homes, this book fulfills a similar mission for readers born decades later. Sandler’s account is riveting. The stark connections to where we are today are deeply disturbing.